Are you getting what you're paying for from your Network Service Provider? Today's business applications make strong demands on Corporate network infrastructure. It's no longer sufficient to know simply the raw throughput of Wide-Area Network circuits between company locations. More than ever before, Enterprise IT departments require to understand not only peak throughput, but other factors which may have a critical impact on users' experience of their business applications. The increasing use of IP-based video sessions in particular, alongside other response-time critical applications, raise the significance of network performance characteristics such as Delay (Latency) and Delay Variation (Jitter). The nature of TCP/IP communication itself is such that Packet Loss leads to re-transmission and as the level of any loss within a network rises, even to modest levels, the amount of traffic re-transmission can impact available bandwidth and compound the problem with further losses. For newly commissioned network circuits, not every Service Provider is able to offer 'birth certificate' documentation, detailing actual measured characteristics, 'end-to-end' across the network core, since not every Service Provider deploys managed 'demarcation equipment' at the point of hand-off of their circuits to the customer's Local Area Network at each site. This is particularly the case for layer-2 Ethernet networks, or IP networks bought on a 'Wires only' connection basis, for which the Service Provider does not deploy managed customer-premise Routers which might provide the basis for detailed performance measurement at the time of network commissioning. Moreover, even armed with a 'clean bill of health' for a newly commissioned network, with today's non-deterministic MPLS based Carrier network infrastructures, it's not always obvious that network performance for a given link may not experience degradation at times of peak loading, or indeed just regularly throughout the business day. 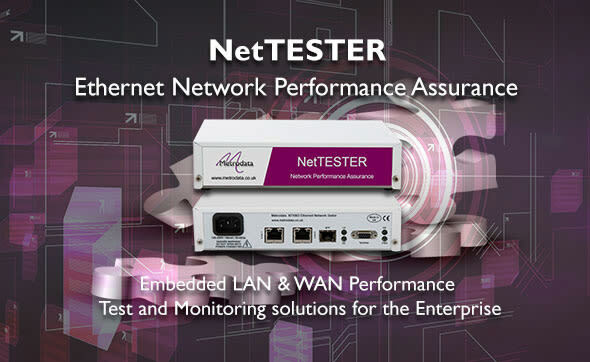 Metrodata's NetTESTER network performance assurance probes provide a cost-effective way of accurately measuring the performance of newly installed network circuits, comprising either 'Layer-2' Switched Ethernet or 'Layer-'3 IP Routed infrastructure. Thereafter, ongoing 'in-service' performance can be readily monitored and alarms raised in the event that performance falls below pre-defined levels, most likely related to the 'service level agreement' (SLA) criteria established with the Service Provider in relation to Throughput, Latency, Jitter, Packet Loss and overall 'availability' for a given link. 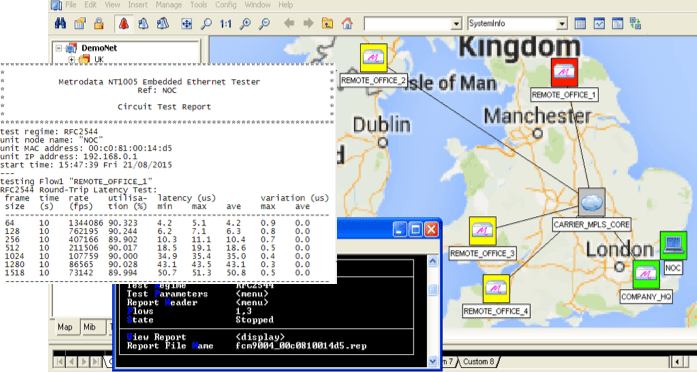 Metrodata Ltd. offers cost-effective NetTESTER probes for network links of up to 10Gbps. In use with both Telecoms Carriers and Corporate Enterprises for whom Network connectivity is a critical resource, tune into the power of NetTESTER today.